We've recently been redecorating Little Miss' room and I've been on the hunt for those pretty little touches to make it look great. 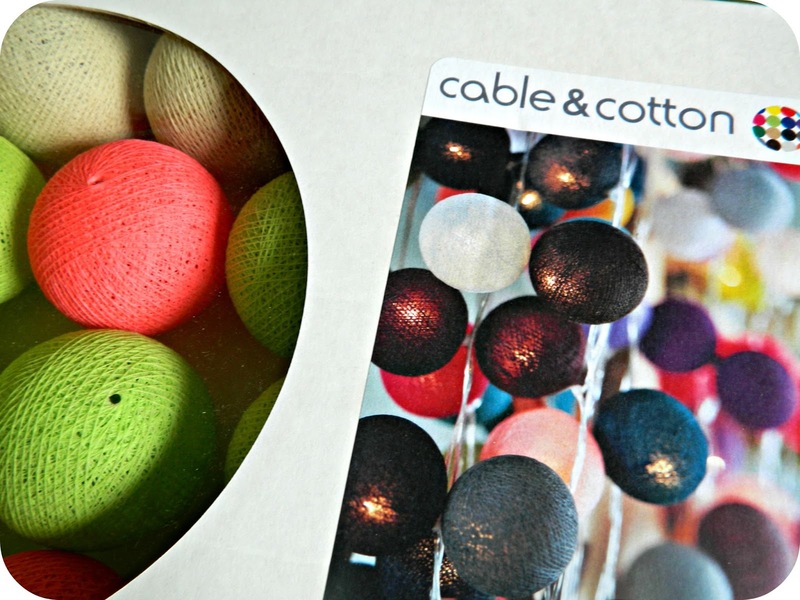 When the opportunity arose to review a string of lights from Cable & Cotton I jumped at it as, in addition to their stylish collections, they have a create your own facility which allows you to match your lights to the decor of the room they will be hung in. 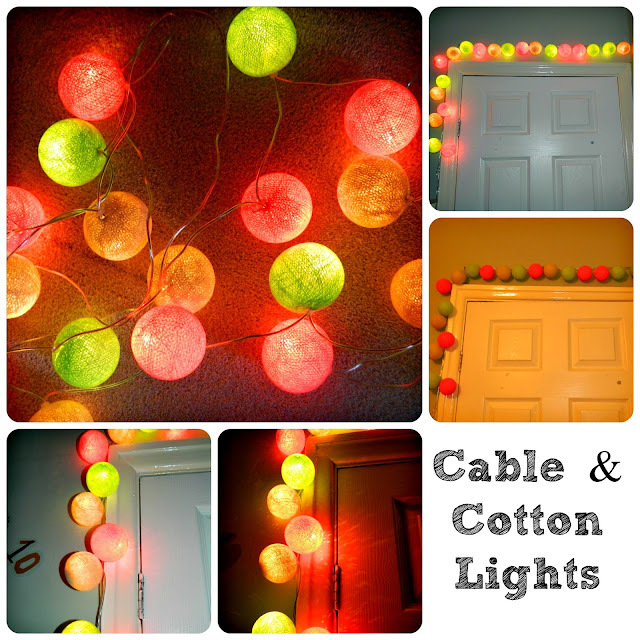 I always think that lights in this style are the perfect way to add a little colour, and soft lighting to a room. I've thought quite a bit about the lighting in her room and, in addition to these lights Little Miss also has her main overhead light, a lamp and a night light. I searched through the various collections of lights that Cable & Cotton have but none of the colour schemes really matched Little Miss' room so I decided to use the 'pick your own' facility to choose the colours that would match best. Her room has pale sage green walls with pink furnishings, I love the look of these colours together and decided I would use them in these lights. When you choose the pick your own option you open a simple wizard which allows you to choose the colours that you like and mix and match them until you have decided upon the scheme that you like. I decided to stick to three colours but I've seen some gorgeous examples of more multicoloured chains of lights, like the one created by ET Speaks From Home. 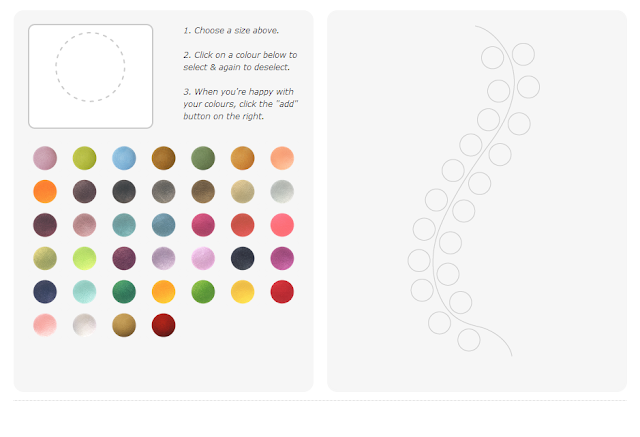 The website is easy to use and you can choose from more than forty different colours of bulbs to assemble your string. 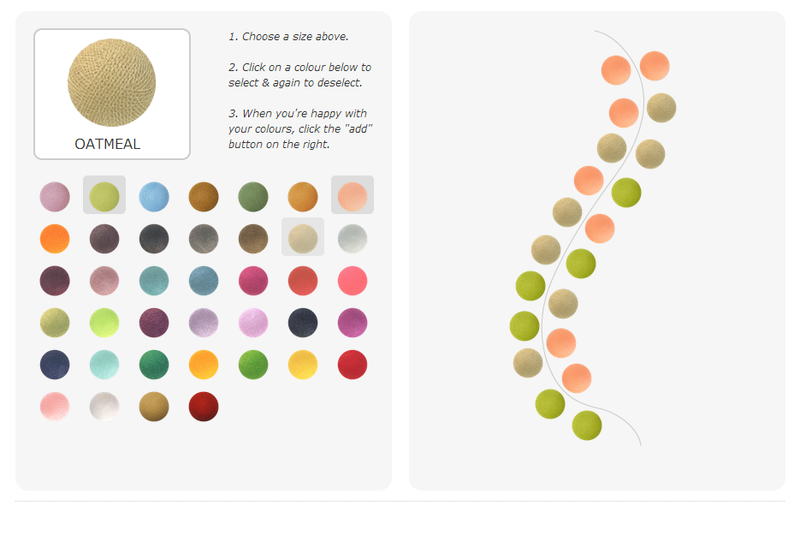 As you click on each colour it is added to the chain so the first colour makes all of the balls change colour, a second colour makes half of the balls the first colour and half the second, and so on. Don't be too worried about the order of your lights as shown, they arrive loose in the box for you to assemble and decide upon the order at home. You do need to ensure that you have the correct number of each colour, for example, on mine I wanted seven each of the pink and green, and six of the beige. I just rearranged my lights until the totals were right and then I could order. My order arrived quickly and was very well packaged in a sturdy cardboard box. The light covers (the balls) are made by wrapping thread around a balloon (using a natural gum), drying it and then removing the balloon. This means that every one is individual and unique. They are quite fragile, you don't want to bash them and I'd recommend keeping them away from children as they are likely to squash them. To assemble your string of lights you simply push the light bulb on the string through the hole in the cover. This feels quite strange at first as, the beige especially, felt quite resistent. They do push through easily though and then you simply push up the plastic ring at the base of each bulb up to secure it. We've hung our lights around Little Miss' bedroom door, I'm really pleased. They are out of the way of little hands and look pretty whether switched on or off. We used cable holders to fix them to the wall, and as the lights don't weigh very much, this works well. The picture below shows the lights in natural light and with a flash. It doesn't really do them justice, they are much nicer. The lights are excellent quality and, currently priced at £22:95 for 20 lights, they are good value. I think I may be back to order a string for our bedroom when we finally get around to decorating in there.